Do you have a blog or website and would like to earn some extra money? If so then I invite you to Join the Tea Collection Affiliate Program. 1. Tea is a good global citizen. 2. Rich and vibrant colors. 4. Layers that mix from season to season. 5. Oh - So - Beautiful Prints. 6. Super - easy wardrobe sets. 7. Graphic tees that mean something. 8. Super - soft cotton. 9. 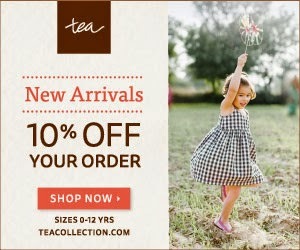 Kids love to wear Tea. Join the Tea Collection Affiliate Program today and start earning!